Why Eryanping Trail is special ? Alishan is famous of its sunrise. Almost every tourist want to know where is the best spot for it. Comparing to finding those tea-harvesting beauties in Alishan, it is even harder to see the dawn. However, you will have a better shot for the sunset. There are several locations to see sunset in Alishan. The popular options are always the observation deck in front of Ciyun Temple and Eryanping in Alishan Youth Activity Center, while the locals and photographers prefer Eryanping in which they can take photos of sea of clouds, setting sun and gallery road. What to explore at Eryanping Trail? After proceeding uphill on the trail towards transmit base station from Provincial Highway 18, passing through a tea plantation and crossing a bamboo grove, you may eventually reach a kiosk with observation deck on different altitude. In the right season, you can see female tea-harvesters working among the mist; if you are lucky enough, you will be able to see hill peaks, like islands, floating on sea of clouds. Regardless the length of the trail, your wishes could be fulfilled if coming in a good weather. It is really a secret sightseeing location recommended to visit. As Eryanping sits at Xiding (隙頂) and is an hour driving-distances from Alishan National Scenic Area, it is not advised to accommodate in scenic area if sea of clouds and sunset are on your agenda. How to get to Eryanping Trail? From Chiayi Station, you can take bus 7322 towards Alishan which stop at Anding (鞍頂). This bus stop is located right next to the Eryanping Trail (二萬坪) in Aalishan. The journey takes you more than 2 hours, depending on traffic and costs 137NT$. There is not much to see because of the bamboo trees blocking your view but when get to the two "scenic lookout" roofed terrace near the top, the view is spectacular. You also see tea plantations on the same spot where the roofed terraces are. The locals say: "the best time to come here is October to December. You can see the perfect sunset and sea of cloud. Keep in mind the weather on the mountain changes very rapidly. In the morning it is clear and sunny and a few hours later the mountain is completely covered by moist, dense, moving clouds. You should beware that the trail is very steep and can make you exhausted after you reach the second section. The trail’s entrance is at the 53.5K point on the Alishan Highway and has a viewing platform. If you leave the trail after sunset and too late to back to Chiayi, there's B&B near the trail, and you can stay there. The trail starts or ends at 53K beside the 53.1 Homestay minsu where we stayed for 4D3N. Eryanping Trail is very steep consisting of over hundreds if not thousands of wooden, uneven steps to get to just the first two roofed terraces at the top of the mountain (not the highest point of the Trail) at as much as 50 or 60 degree angles. The beginning leg of the trail is surrounded by very dense bamboo trees followed by a big boulder blocking your way in which you have to walk around it in order to go further. There is not much to see because of the bamboo trees blocking your view but when get to the two "scenic lookout" roofed terrace near the top, the view is spectacular, almost 360 degrees panoramic view of the neighboring mountains. Not only that, you also see tea plantations on the same spot where the roofed terraces are. We only been to the first section and we were already extremely exhausted. Knowing our limits that we are not young anymore my wife and I decided that was the end of our hike. The three young girls who stayed at the same minsu as we did hiked beyond the first two roofed terrace at the same morning as we did but decided not to go further as there was no end in sight. From the look of the map, it seems we have only covered less than one-third of the whole trail. More capable hikers may find this challenging. Keep in mind the weather on the mountain changes very rapidly. In the morning it was clear and sunny and a few hours later the mountain was completely covered by moist, dense, moving clouds. Some areas show signs of landslides and there are no railings and no trees to break your fall. If you ever tripped or if the wooden steps become loose and you fell to the side of the cliff, you are done for it. You can pretty much kiss your pretty a_ss goodbye. Oh yes, no trail lights either...one wrong step and you're history. Night hiking is way too risky. Very dangerous. Beware. PS. 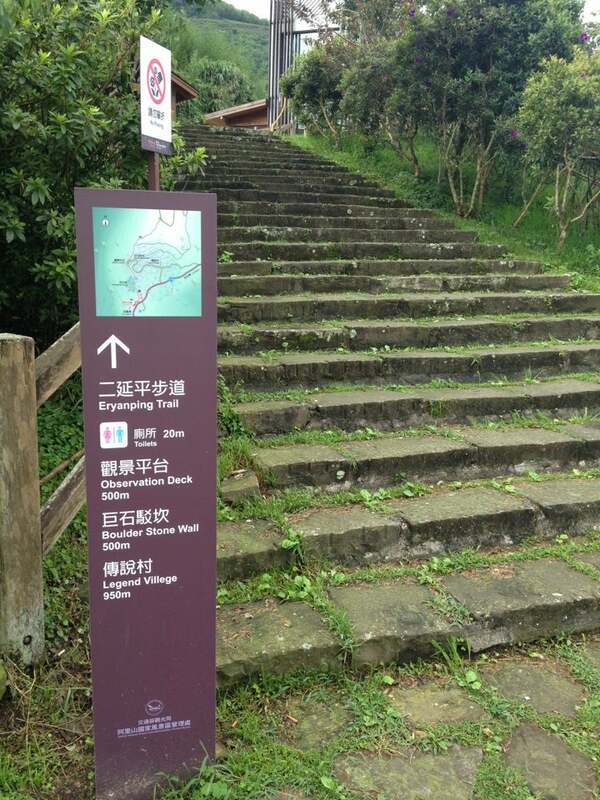 We've hiked the "499-Steps" trail at Cingjing before. Our trek of the Eryanping Trail feels twice as many steps, much steeper and more dangerous.